Panera is one of those places that I feel like I could go to any time, so I hardly ever end up eating there. I really need to change that. 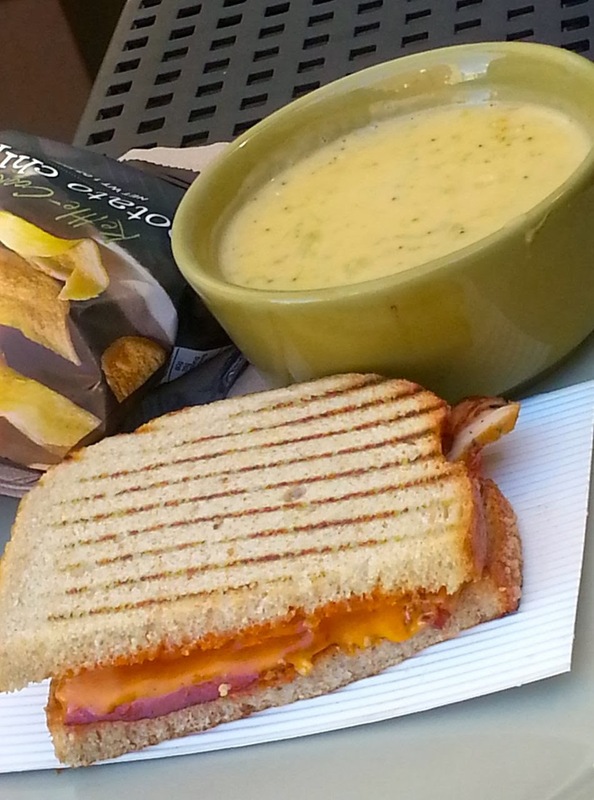 There’s nothing not to like about Panera. They have free WiFi. They have great food. They’re everywhere. Their prices are reasonable. 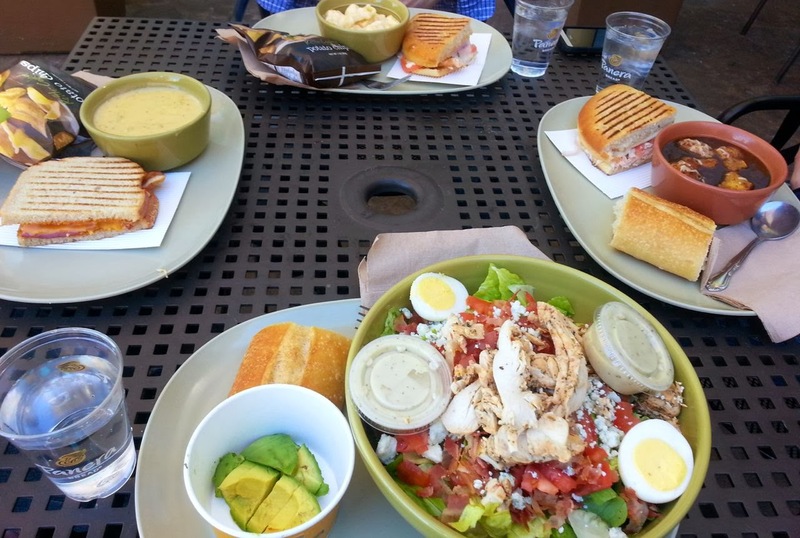 This past Sunday, my husband and I met some friends for lunch at the Panera in Studio City. This is the Panera that I’ve eaten at most often. When my husband and I were dating, we met at this Panera a couple times. My usual was always soup in a bread bowl. I love their bread. On Sunday, it was a beautiful day, so we grabbed a table on the back patio. It was such a pleasant place to sit and relax. It was also pretty quiet and tranquil outside. Inside was a little bit louder and more hectic. One of our friends held onto the table while the rest of us went inside to order. Everyone except me got a You Pick Two combo. You get to pick two of the following: a cup of soup, a half pasta, a half salad, or a half sandwich. Of the three people that ordered the You Pick Two combos, none of them got the same thing. That’s the beauty of it. My husband ordered a You Pick Two combo that consisted of a cup of Broccoli Cheddar Soup and half of a Chipotle Chicken Panini. The soup is described on the menu as "chopped broccoli, shredded carrots and select seasonings simmered in a velvety smooth cheese sauce." This particular soup is served daily, but they have some soups that are only served one day a week. The Chipotle Chicken Panini is described on the menu as “all-natural, antibiotic-free chicken, applewood-smoked bacon, smoked cheddar, tomatoes and ancho-chipotle spread all grilled on our freshly baked French Bread.” He also got to pick a side. The options were an apple, a bag of chips, or bread. He chose chips. I’ve had the Broccoli Cheese Soup before, so I know it’s good. I didn’t taste the Panini, but I was surprised that it looked more like sliced chicken. I was expecting something thicker, like a chicken breast. My husband really liked it and would definitely order it again. Trying to make a healthier choice than soup in a bread bowl, I ordered the Chicken Cobb with Avocado Salad, which is described on the menu as “all-natural, antibiotic-free chicken, romaine lettuce, tomatoes, applewood-smoked bacon, Gorgonzola and hard-boiled egg are all tossed with herb vinaigrette then topped with fresh avocado.” I asked for the dressing on the side, and I also asked for the avocado on the side. I don’t really like avocado, but my husband does, so I gave it to him. I also got to choose a side, and I chose bread. The salad was nice and big. I love salads, and this one didn’t disappoint. I really loved everything about it and would probably order the exact same thing again next time. 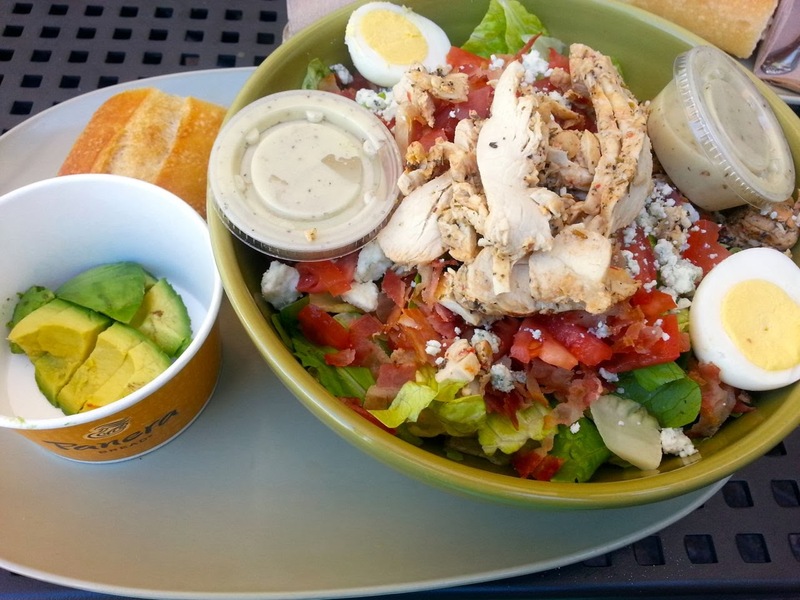 Or, maybe I’d do a Pick 2 combo and get a half order of this salad and a cup of soup or half a sandwich. Who knows. There are too many options! Panera knows how to do the bakery/deli/café thing right. We didn’t order drinks or dessert this visit, but we have in the past. It’s all good. I also love that they have free WiFi. It’s particularly nice if you’re trying to get some work done and don’t want to go to Starbucks.